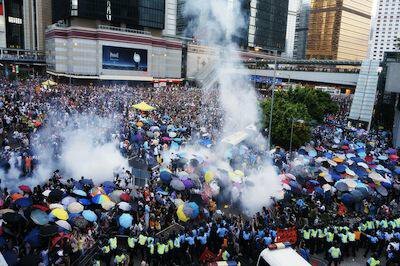 Hong Kong protesters face tear gas. PH Yang/Demotix. All rights reserved.Hong Kong: the former British colony that still runs double-decker buses and drives on the left; the fast-paced, vertical global city and glamorous finance hub; on a map of China, the autonomous region is only a dot. The recent mass protests disrupt these well-established images of Hong Kong and call for a new narrative, even though colonial history, neoliberal urban governance, and Chinese authoritarianism all bear on the current situation. What is now being branded the Umbrella Revolution of Hong Kong is seeing its sixth day. Events in Hong Kong erupted on 28 September, when the occupation of Civic Square near the government headquarters by striking students and citizens was violently suppressed. As a result, people flooded the streets and the civil disobedience movement Occupy Central with Love and Peace (OCLP) began earlier than its original launch date of 1 October, choosing instead to ride the momentum inspired by the students. The demands, as formulated by OCLP, call for the resignation of the unpopular Chief Executive Chun-ying Leung and the withdrawal of China’s National People’s Congress Standing Committee regarding its proposed framework for the 2017 elections. According to this proposal, any candidate for the top position of Chief Executive in Hong Kong must meet two criteria: 50 percent approval by a de facto pro-Beijing nomination committee, and ‘patriotism’ as determined by the central government in Beijing. As international scholars currently based in Hong Kong, we move around the world, and our research interests lie at the intersection of urban struggles and democratic politics. From this vantage point and on the ground at the protests, we want to highlight Hong Kong’s particular context and history in relation to certain globalizing forms of political expression. To this end, we interviewed and listened to fellow academics and student activists, as well as graduate students from mainland China in Hong Kong. These historical readings by themselves are inadequate since rather than rising from a regional history only, Hong Kong’s uprising also partakes in contemporary urban struggles and democratic movements in global cities under neoliberal governance elsewhere. For those who have followed protest movements such as the Occupy movement of 2011 in the US and the Gezi Uprising of 2013 in Turkey, Hong Kong’s adaptation of globalizing forms of political expression is obvious. In fact, posting pictures of Hong Kong’s scenes of protest on social media makes our friends in Istanbul tear up as they are reminded of the days of the Gezi Uprising. As we have observed the unfolding protests in Hong Kong, we have noted many examples of globalizing forms of political expression. Protesters deliberate in small groups and use soapboxes for impromptu speeches. Iconic imagery circulating through social media, street art, and spontaneous performances of ‘Do You Hear the People Sing?’ are all highly affective forms of communication. Under the banner of ‘boycott classes, keep learning’, Hong Kong’s student strike introduced public lectures by academics, open and mobile classrooms, libraries on the street, and even classrooms designated for parents of secondary-school students who have joined the protests. Such methods consciously underscore decentralized self-organization. Wu further delineated the composition of the current protest movement, suggesting that diversity is as important an aspiration in Hong Kong as it was in the US Occupy movement and the Gezi Uprising in Istanbul. Besides OCLP, the student federation, some political parties, and pressure groups, there are organizations concerned with issues such as labour rights, feminism, affordable housing, and social justice. Wu added: “some seek to demonstrate the importance of different social groups - women, new immigrants, workers, ethnic minorities - participating in the movement for political reform and universal suffrage.” Such advocates have stepped in to organize public discussions and gatherings on the street, bringing together urban residents who heretofore have had little interaction with each other. Secondly, below the recent unifying slogans of ‘true democracy’ and ‘C.Y. Leung, step down,’ Hong Kong’s protest movement is riven by different interests and aims. It is unclear through what mechanisms these differences can be negotiated within the protest movement. Some would like to expand the definition of democracy upheld by OCLP and address empowerment and inclusion in much broader terms. During a meeting of the Civic Party that we recently attended, one student leader expressed her expectation that constitutional democracy could tackle the high inequality between rich and poor in Hong Kong. By contrast, during a recent open discussion in Mong Kok, an NGO representative who works with laid-off women workers argued that until the whole political-economic system is transformed, electoral rights would not guarantee a more equal society. Ironically, at a time when protest movements elsewhere tend to seek alternative sources of political authority, Hong Kong demands representative democracy. Recall that Occupy in the US distanced itself from institutionalized politics including the political parties and trade unions. Similarly, in Turkey protesters contested the government’s victories at the ballot box, arguing that privileging this technique of rendering the ‘will of the people’ merely supports a majoritarian take on democracy. However, democracy as a lived aspiration and a struggle that inspires people may be more valuable than the actual political systems that carry the title. The struggle that Hong Kong experiences now holds this inconclusive moment.